Buying a new roof can be overwhelming. It is an important purchase, and it's hard to know how to make the right choice. This article can help guide you through the process of how to buy a new roof. What Type of New Roof Do You Need? When considering how to buy a new roof, the first thing to figure out is what kind of new roof you need. There are many different types of roofing, suitable for all different budgets and climates. For example, if you live in a hot climate, getting a cool roof is a good choice. Coof roofing is available in budget-friendly asphalt roofing, or more expensive - but much longer lasting - metal roofing. What is the Best Season to Install a New Roof? 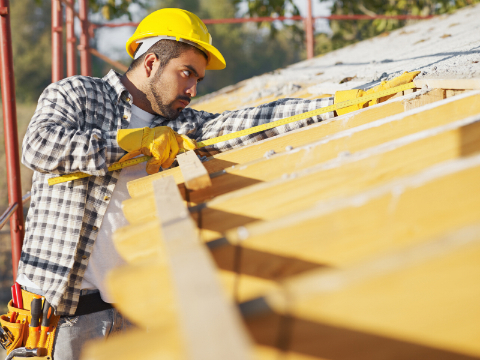 The best season for getting a new roof is in late summer or fall. At this time, the rainy season is over and it is not overly hot, so heat exhaustion is less likely. This also means longer working hours are possible, so your new roof will be finished faster. However, if getting a new roof is an urgent matter, do not wait for the right season as the damage caused by roof leaks is very expensive. What is the Cost of Buying a New Roof? The cost of buying a new roof is highly variable, ranging from $7,000 to $30,000 on average. The cost of a new roof isn’t just about the type of roof you choose, but also repairs to your roof decking, the size of your roof, your location and more. Consider the longevity of the roof. If you can afford it, it’s worth shelling out a bit more cash for a longer lasting roof. You’ll save yourself a lot of money down the road. Check with the Database of State Incentives for Renewables and Efficiency, as getting rebates and loans for buying new roofing is becoming easier. How Do I Choose a Roofing Contractor? Choosing a contractor to install your new roof is the most important step. The right contractor will be able to lead you through the entire process of how to buy a new roof, and will make sure the job is done right. Be sure to get at least three quotes. Using HomeAdvancement's online form is a fast and free way to connect with qualified roofers in your area.